JONESBORO, GA – 40 years ago, Smokey and the Bandit was the second largest grossing movie of 1977 – which most movie fans know. 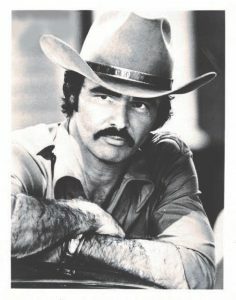 What many fans don’t know, is that the run that took Jerry Reed as the Snowman and Burt Reynolds as the Bandit from Atlanta to Texarkana, Texas and back again in 28 hours, was largely filmed in and around the city of Jonesboro, Georgia. This June, the Bandit is coming back! To honor and celebrate the movie’s big milestone, Jonesboro is hosting the official 40th Year Anniversary Celebration. The City has partnered with the Burt Reynolds Institute, Restore a Muscle Car, The Bandit Run & the Snowman’s Run to Benefit Wounded Veterans to deliver THE biggest commemorative Smokey and the Bandit celebration over a two-day event, Friday, June 23rd and Saturday,June 24th. As part of the celebration, the 11th annual Bandit Run, sponsored by Restore a Muscle Car of Lincoln, Nebraska, will be driving in from Texarkana with more than 250 cars– primarily Pontiac Trans Ams. Wednesday June 21st they will meet up in Franklin, Georgia with the Snowman’s Run coming in from Tallahassee, Florida. The entire group will then roll into Jonesboro about 3:30pm Wednesday to kick off the 40th anniversary event. Friday, June 23, 2017 at 12:00 noon – Reenactment of Coors Scene in Downtown Jonesboro. Those Media personnel wishing to attend, must obtain credentials by contactingCity Hall at 770-478-3800. Those persons without credentials will not be allowed on the street. $10 and can be obtained by contacting City Hall. Friday, June 23, 2017 at 9:00 p.m. – Official showing of the Smokey & the Bandit Movie on the lawn of Lee Street Park located at 155 Lee Street. Saturday, June 24, 2017 from 11:00 a.m. – 5:00 p.m. – Smokey & the Bandit festival featuring live sound stage, performances, car show, a Bandit look-alike contest judged byHot Pants Hilliard Susie Ewing and much more.